E-fu noodles (aka Yi mein in Cantonese, 伊麵), are often consumed on birthday celebrations in Hong Kong, thus they are also named as "Longevity (long) life" noodles (Sau mein 壽麵). They are flat egg-noodles, made by wheat flour. You might easily find them from any Asian stores, that are deep-fried first before packed in a plastic bag for sale. When it comes to cooking e-fu noodles, all you need is to blanch them in boiling water to get rid of any excess oil, and then cook briefly in simmering liquid. Its colour of golden yellow is very attractive, along with its chewy and elastic texture make them stand out of the crowd. Generally speaking, Chinese people categorize e-fu noodles as a kind of only-have-it-on-special occasions one. Cook e-fu noodles in boiling water until softened, about 3 minutes. Drain well, immediately rinse with running cold water. Drain well again. Set aside. Heat oil in a wok or a large pan. Saute the shallot until aromatic over medium-high heat. Add the ginger and scallion. Pour in the seasonings, bring it to a boil. Add the noodles. Decrease heat and simmer until noodles absorb the flavours, for about 5 to 8 minutes. Season with sesame oil. Transfer to 2 to 3 serving plates. Cover to keep warm. Set aside. Use the same wok. Pour in 200 ml of chicken stock. Cook until it boils over high heat. Toss in crab meat. When it boils again, stir in the thickening and cook to preferred consistency. Add the egg white and lightly stir with a fork. Once the egg white turns white, quickly dish up. Ladle over the noodles or transfer into the cooked crab shells. Serve hot. You might choose mud crabs or sand crabs, as long as they are fresh and you like them. 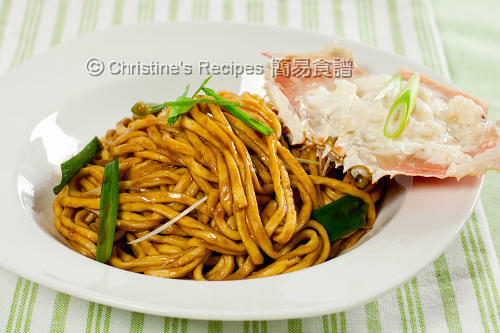 Put a few extra slices of ginger and 1 to 2 stalks of scallion to steam with the crabs, to get rid of any fishy smell if they have any. Young kids will love this dish as they don’t have any trouble in removing the crab shells. Or you might like to use frozen crab meat if it comes in handy to you. You can substitute the crab meat with any other meats you like, or simply omit it. Or add more favourite vegetables. The oyster sauce goes with the noodles really well. As e-fu noodles are highly absorbent, they tend to soak up a lot of the moisture when wet ingredients are added, so they would take on all the flavors in the sauce. When it comes to cooking this kind of noodles, don’t let the noodles sit too long before serving. They become dry and too salty otherwise. I've just had dinner, but this is making me very hungry! I'm glad that I've found your blog, I can't wait to try lots of Cantonese recipes on here. Good to have this homemade indeed : ). Haven't had this in awhile, the colour makes it looks so yummy! Friends usually ask me why I love 伊麵 (which to them are like "rubber-bands") but I don't know why. I just like it. 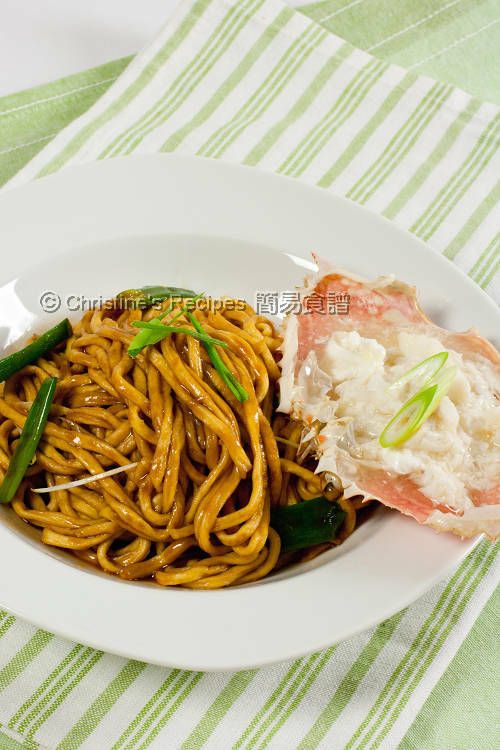 Love the indulgent take with crab meat :) ...makes me hungry and like 伊麵 even more than before. Hi christine! Was blog hopping and came here! Love this version of the noodles..and how tempting that crab looks beside it. Perfect restaurant style meal at home. I am eying some more recipes on your blog! I love Yi mein but so far haven't had good cooking experience with them. This is definitely on my to-try list. Thanks! i dont have to wait for special occasions to have this..infact i can have this for breakfast and lunch. Nice dish! A very interesting post as I was not aware of these types of noodles; now I am going to be hunting for them! Very nice looking noodles...rarely cook them because they are so easily available and cheap here! Hi Christine! I'm so glad you found my blog so I could find yours! I love the recipes on here!